“Wow… yet another 150nm day…” I said, looking at our morning position. We had recently estimated a 9pm arrival on Tuesday. So we had tried slowing down the boat with an even smaller headsail, to spend another night at sea and arrive at first light the following day. But the wind didn’t let up, and racehorse Aldebaran kept galloping, reaching for a 3pm arrival in Hao tomorrow. We were fairly relieved by this prospect because we were both a bit nauseous and headachy from all the rough sailing. All was going well… I was napping down below when I felt the boat speed accelerate dramatically. That was when the monster squall hit. The boat was heeling under the strain. I jumped into the cockpit, Sabrina had already taken the autopilot off and was hand steering, one glance to the wind meter showed 32kts, I immediately reached for the outer jib sheet and released it one turn from the enormous load, then opened the cam cleat to ease the mainsheet as well, which started luffing uncomfortably, “fall off” I grunted, Sabrina steered away from the wind, and just as we were about to catch our breath, FLAP FLAP FLAP!! The inner jib had shredded to pieces with a 36kt gust. It was a horrible loud noise. Forget about the inner jib, it was toast. I jammed on my harness, clipped into the jackline, and raced to the mast to drop the much more important mainsail. It was down in a flash, thanks to the “fast-track” that the previous owners (Bob and Jackie) had wisely installed. Why has this been happening? Turns out our inner jib track is in a poor position, which causes undue strain on the sail. Also, we need stronger sails than what’s available at second hand stores, which has been our purchase location to date… Solution: we need to order a custom sail and possibly change the track as well. What’s the inner jib, anyway? 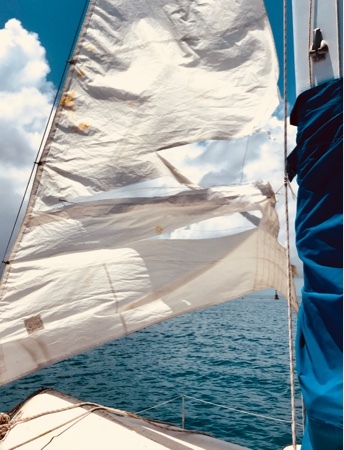 It is a small headsail that rides next to the mast, primarily to keep our steerage while we are changing the outer jib. It can also be exchanged for the storm inner jib, which is what we raised in its place. The storm inner jib is a bomb-proof tiny sail. If there are high winds of 40+ kts we’d only have this little guy up, and all the other sails would be down. Over 45-50kts, everything is down, and it’s sea anchor time for Aldebaran, where we “park the boat” with a huge underwater parachute. We’ve never encountered such winds at sea but we’ve deployed the parachute sea anchor for practice. Thankfully, our important sails had been spared – the outer jib and mainsail. We sailed the rest of the squall at 7kts with just the small outer jib driving the boat through the horizontal rain. An hour later we raised the double reefed mainsail. That was the last big blow of the storm… whose bulk was now hitting Tahiti, 400nm to our west. By midnight, Aldebaran had marched into a starry sky, far enough east by now to get away from the storm’s effects. We were a bit rattled but all was good, and we had less than 100nm to go! Yikes! You are hearty folk! Wow! This narrative defines sailing adventures. Aldebaran did wonderfully and you equally so. The stats are amazing: another 150+ nm in 24hrs, new maximum speed of 13.8 kts, 36 kts winds. Amazing!